When you go to SWANKY dinner parties or restaurants, the stereotyped servings of salmon are either slices, fillets, slabs, or the whole fish itself. If you prefer the chewy slices, salmon is prepared typically by smoking or salt-cured or simply as the raw sashimi or carpaccio. For the (usual) dry, overcooked and flaky salmon, the fillet is either served grilled, broiled, braised, baked, roasted, seared or sautéed. For events that call for a large gathering, the slab or the whole salmon is either baked, poached, roasted, broiled or grilled. However, appreciation of salmon dishes should not be boring, lest we forget that the salmon is an adventurous and diadromous fish. Adult salmon have to brave through waterfalls and predators to return to their freshwater spawning grounds before they turn pink and die. Salmon smolts have to survive natural enemies before they can reach and spend their adulthood in the sea, which also does not guarantee their return to spawning grounds. If the salmon can be fearless in their life cycle, then why not take a risk in preparing an unknown salmon dish? No, I am not talking about using a dishwasher to cook your salmon (although you could) but rather I am talking about coulibiac. Basically, this is a pot pie filled with alternating layers of rice, salmon, diced mushrooms and cream. Salmon is not a traditional French seafood ingredient especially when you think about fish mousse, quenelles, fish stews and pâtés. Instead, salmon is used in Nordic and Russian cuisine. 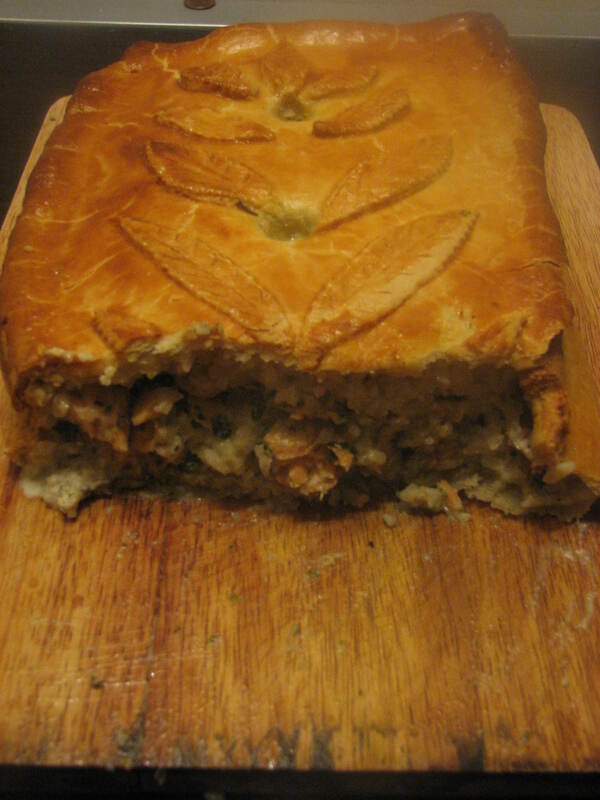 Coulibiac is actually a Russian dish (Cyrillic: кулебя́ка; Pronunciation: kulebyáka) with French roots because the Russian nobility (in St. Petersburg), being inspired with the culture from Western Europe, imported French chefs in the late 17th century to innovate new dishes. The French chef, Auguste Escoffier, then brought the dish from Russia to France during the early 20th century. This was also featured in the second season of Julia Child’s celebrated show, The French Chef. Since I do not have the DVD nor video files of the series, I am clueless on whether she learned this in Le Cordon Bleu or she got the recipe from Escoffier’s book Le Guide Culinaire. I got to try her recipe because I bought her “The French Chef Cookbook”. Based from my own experience, the coulibiac took seven hours to complete. This includes kneading and preparing the pâte demi-feuilletée a.k.a. the mock puff pastry case. I know seven hours sounds horrific but what I can I say? I am a culinary purist who prefers to start everything from scratch. But fear not and let us learn from the salmon life cycle! After all that long grueling work, the dish is all worth my time. One, the dish is heavy, rich and flavorful that taking a half-inch slice can easily make me full. Two, since I eat coulibiac alone, it takes AT LEAST 6 meals to finish the entire thing, which saved me a lot of time cooking for the following few days. Three, coulibiac is such a handsome dish that it makes a good addition to a dinner party. Leaves are the typical decorations but you can be creative with your design. Four, this is a new and elegant way of preparing and enjoying salmon that I am certain you won’t get bored with this project. 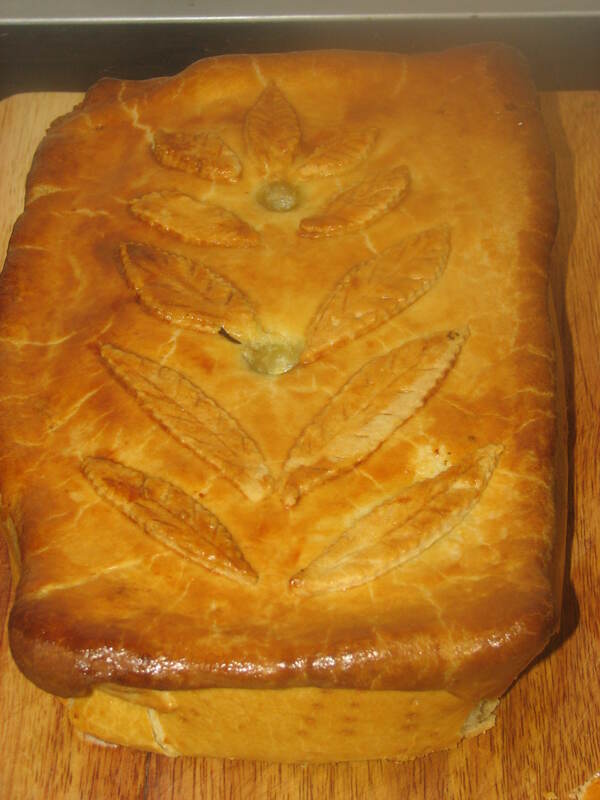 – If you are not a culinary purist, you can “cheat” by buying a puff pastry dough from a grocery store. Then, prepare the filling by yourself. This will save you five hours in the kitchen. However, the bottlenecks of a store-bought puff pastry are less flavor (because it is completely made with vegetable shortening rather than butter), less puff, and more expensive than the homemade puff pastry. – When you cook the salmon filling, you might want to sear the fresh salmon fillet for 1-2 minutes on both sides and cut into 1-inch cubes. After all, the salmon will be heated again. Contrary to the mainstream belief, a flaky fillet is the worst thing that can happen when you are cooking fish. The juicier the fish, the better it will taste and the more flavor it will have. Otherwise, you may also use leftover salmon. – Once the pâte demi-feuilletée is sealed, it is IMPERATIVE that you have an opening at the top of the pastry. You may insert METAL pastry tips or foil funnel to introduce holes. The holes prevent your coulibiac from exploding caused by the build-up of steam and the expansion of the cream sauce. – Before baking, the pastry case can be brushed with egg glazes. Egg glaze (depending on how you prepare them) gives a colorful and shiny appearance to the surface of the pastry. 2. Place the pastry case on a lightly buttered baking sheet. 3. Layer the bottom with a third of the braised rice. Layer with half of the salmon and mushroom filling. Spread with half of the cream sauce. 4. Repeat again with half of the remaining braised rice, half of the salmon and mushroom filling and half of the cream. Top with the rest of the braised rice. If the filling overflows the case, mound the rice layer into a dome. 5. Roll the mock puff pastry cover. The dimensions should be 1 1/2 inches longer and wider than the bottom case. 6. Paint all sides of the case with egg wash. Lay the mock puff pastry cover over the pastry case and seal firmly. 7. 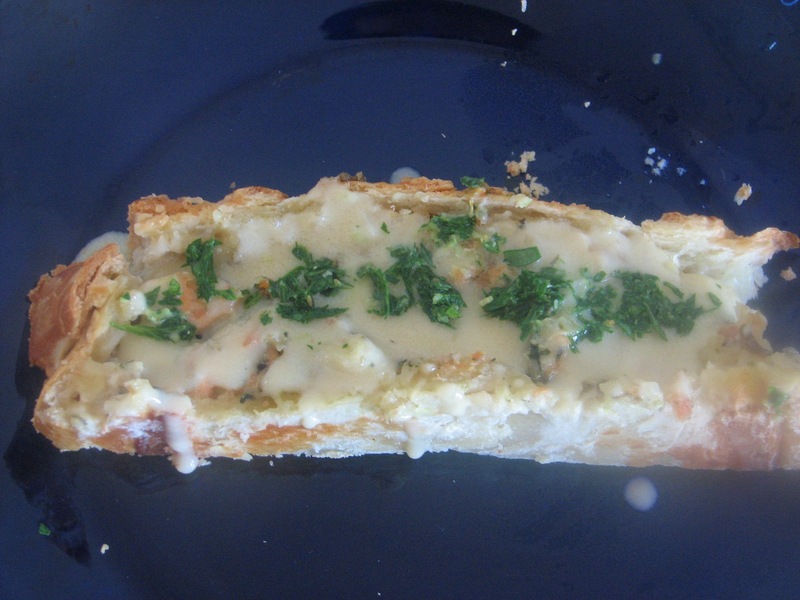 Mold the leftover dough from puff pastry cover into garnishes. Decorate the cover and paint with egg wash. Draw crosshatch markings around the sides of the cover using the tines of a fork. 8. Poke two holes in the cover using pastry tips. If the tips are metallic, leave the tips in the cover. If the tips are plastic, replace with with aluminum foil that has been shaped into a funnel. 9. Bake in the middle of the preheated oven for 45-60 minutes, or until the pastry is nicely browned and you hear bubbling sounds from the funnel-shaped openings. 1. Blend the chilled butter, shortening and the flour in a large mixing bowl, until the mixture looks and feels coarse. 2. Add the cold water. Press the dough together using the cupped fingers of one hand. 3. Roll the dough into a ball. Place on a board. Push the dough away from you using the heel of your hand into a six-inch smear. 4. Press into a bowl. Wrap in waxed paper. Refrigerate for two hours. 5. Once chilling process is over, preheat oven to 220°C (425°F). 6. Mock Puff Pastry Bottom Case. Roll two thirds of the dough into a 1/8 inch thick rectangle. Butter outside of loaf pan. Turn the loaf pan upside down and fit the dough over it. Trim dough evenly all around and prick all over with a fork. Bake inside the oven for 6-8 minutes. Cool and unmold. 7. Mock Puff Pastry Cover. Roll the dough into a rectangle. Spread bottom half with a tablespoon of butter and fold over top half. Repeat this step with another tablespoon of butter. Cover with wax paper and chill. 1. Sauté the onions in butter for 5 minutes. Do not allow them to brown. 2. Stir in rice until the grains look translucent. 3. Add the bouillon and bring to a boil. Stir once. 4. Cover and bring to a simmer without stirring for 18 minutes. 1. Cook the shallots or scallions in butter for 2 minutes under low to moderate heat. 2. Stir the mushrooms, vermouth and cognac. Raise the heat to medium and boil for several minutes to remove the alcohol. 3. Reduce to a simmer and add the salmon, tarragon and parsley. Cook for several minutes under low heat. How many people will this recipe feed as a main course?